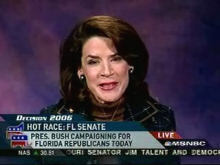 Katherine Harris was on MSNBC trying to spin everything about her campaign. First she starts off by referring to the National Journal as "the liberal media". After that she tries to explain all her staffing turnovers. She is saying that they had to let people go. Funny since all the news about those changes had the staff quitting. After Harris tries to spin the 2000 election debacle, Andrea Mitchell says that Bush will be in Florida campaigning for Harris today, however the Republican gubernatorial candidate will not appear with Bush (which has the White House rather upset). Mitchell's reason for that? "He is busy cleaning out his sock drawer". Perhaps she should have just said that he didn't want to appear with Bush, like many other Republican candidates around the country.